Facebook has announced two more new features at the Facebook event, which was held few days back. apart from the one we saw on how you can download your entire Facebook information as a zip file. The other features they have introduced is a new dashboard for applications you use, and a new Groups feature. 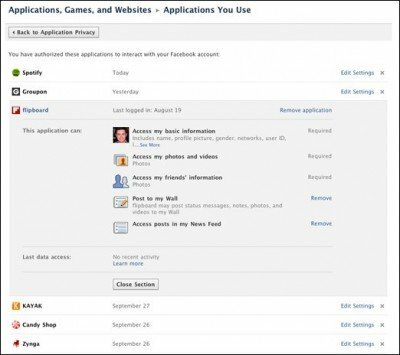 The new Application Settings dashboard lets users better control how Facebook apps, games, and Open Graph API-enabled websites use their data. It also lets users see exactly when and how their data has been accessed through the Facebook Platform. Users have the option to remove unwanted apps, games, or sites, or revoke persistent permissions such as the ability to post on their wall. During the event the CEO of facebook Mark Zuckerberg said “As you start having more social and personalized experiences across the web, it’s important that you can verify exactly how other sites are using your information to make your experience better”. Also with the application dashboard feature, they have also introduced the New Groups feature. In Facebook, we already have a choice of creating a seperate friends list. But you realize over a period of time that none of them seem to be using that. So Facebook has now introduced this new Group feature, in addition to the existing friends list feature. Create groups of friends i.e. you can have a group that certain friends can only see and participate in. Friends you add to the Group can also add their friends and friends of friends. Group Chats for many people. The new Facebook Group Feature essentially allows you to have control over who gets to see what and who does not. It also allows you to have control over what is shared, how it is shared and people to share with. You can create a separate groups for your friends and family etc. You can have a Group chat feature with members of that group. This feature will change how people use Facebook in general. These groups includes, shared space, group chats, email lists etc. If you’re annoyed with the many notifications from the groups which you’re added, you can control the notifications from the email settings and you have choice to leave the group too. You’ll be notified when you are added. Everyone in the group is notified when a new member is added. What’s your take on this new Group feature and the Application Settings dashboard? Do let us know in comments below. Although certain features for the new group layouts (for example, the group chat) are both interesting and beneficial, the previous layout was superior in terms of visual appeal, availability of information, organisation, and accountability. Under the new layout, significant amounts of space are dedicated to tracks of information that are already available from the homepage. This is at the cost of larger group images, clear group descriptions, and a clear distinction between one aspect of the website and another. Additionally, users may now be “added” to groups, instead of invited. This damages the sense of autonomy in Facebook users and is contrary to their freedom of association, as they are no longer the primary actor over what they connect with. Admittedly, Facebook users are still able to leave groups, but why must reactionary disassociation be a necessary condition in order to properly define oneself?